Looking for a way to make sandwiches without the carbs and gluten? 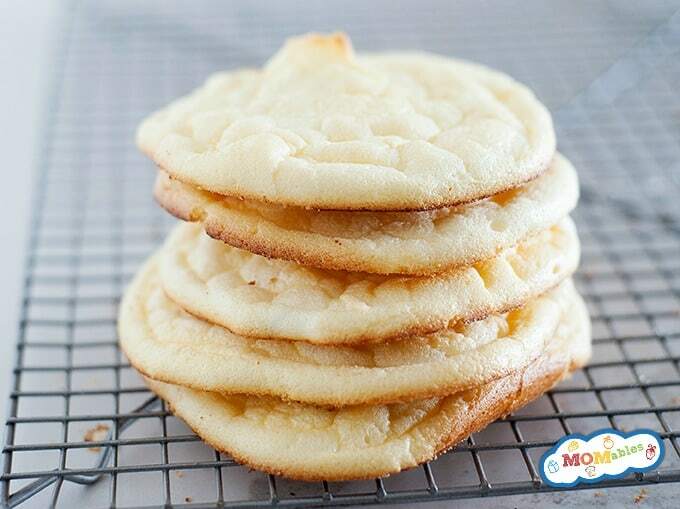 This cloud bread recipe is the perfect way to hold your favorite things together. 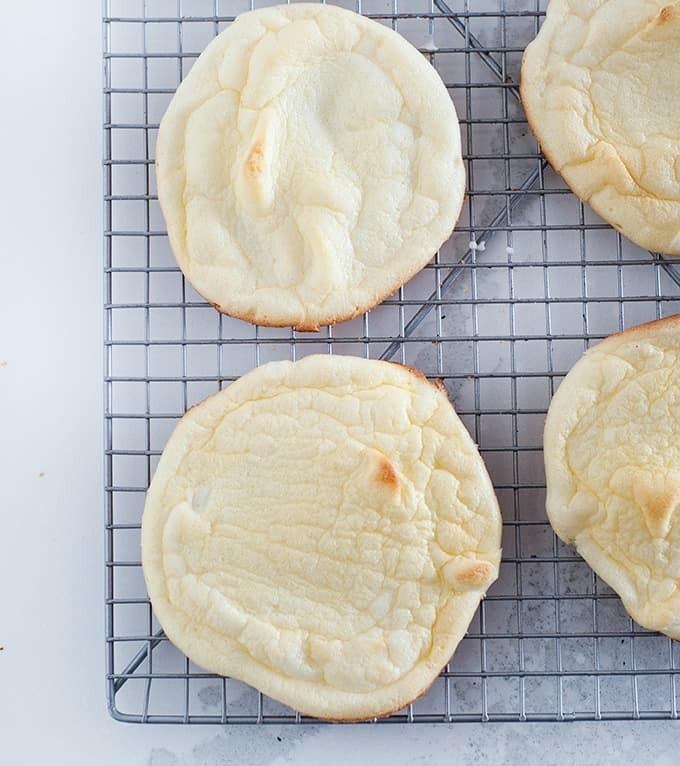 This recipe for cloud bread also referred to it as Keto bread or No-Carb Cloud Bread is the perfect solution to your bread-free woes. I mean, sometimes you just want a sandwich! And making it is so easy you are not going to believe it. These delicious little rounds are gluten-free, have practically no carbs and the perfect substitute for regular bread! It proves that you can be gluten-free and still enjoy mealtime! For more inspiration check out our Grain-Free Meal Plan, it’s full of family-friendly recipes that are yummy and of course, gluten-free and grain-free! Having a household that is mostly gluten-free, seemed to be a challenge, at first. I mean sandwiches are the quintessential lunch food, and if you are gluten-free, you have two options; no sandwiches or gluten-free bread, that is expensive and tends to dry out. After spending a small fortune, I was desperate for a better way. Thankfully, I discovered this recipe, and haven’t looked back since. I also eat a Ketogenic diet for about four months, twice a year. The first few rounds were not so bad because I was focused on my health; however, after a while, I practically salivated every time I’d make a peanut butter and jelly sandwich for someone in my family. With this recipe, I don’t have to miss out. Can I also add, that this recipe is made with only three ingredients! Eggs, cream cheese, and cream of tartar. So technically, not only are these no-carb and easy to make, they are also cheaper than a loaf of bread! Now before making this recipe, it is super important to READ the directions from start to finish since the cream cheese will need to be room temperature, the eggs separated, and egg whites beaten. 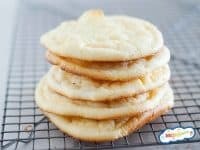 This is a simple recipe but if one step is skipped or done wrong, the cloud bread will not come out in those light, fluffy rounds. Another major key to a successful cloud bread batch is baking! The oven HAS to be 300F. Nowadays, most ovens have both the bake and convection bake option, this means the oven turns on a fan which circulates the heat, adding about 25 degrees to the temperature. If your oven is too hot, it will sadly burn the Cloud Bread and leave you breadless. I’m positive if you keep an eye on these guys you will avoid all burnt goods and achieve that light, fluffy, cheesy cloud! One final note is that I’ve tried this recipe with cottage cheese and the texture of the bread is different. The batter is runnier, and the bread rounds are flat and not as fluffy. For best results, use full-fat cream cheese. You can top these with your favorite nut butter or jelly, make a classic sandwich, or eat them plain. The possibilities are endless! Preheat the oven to 300F and line two baking sheets with parchment paper or a silicone mat. In one bowl, combine the egg yolks with the softened cream cheese and stevia until you have a smooth batter. In a large bowl or the bowl of your stand mixer, place egg whites and cream of tartar. Whisk the egg whites on medium speed, moving up to high speed until they are fluffy and stiff peaks have formed. With a rubber spatula, gently fold the egg yolk mixture into the egg whites until combined. Scoop the mixture onto the baking sheets with a spoon and shape them into 3/4-inch thick, 4-inch rounds. Bake approximately for 30 minutes, until they are golden. *NOTE that cooking times will vary as this is a very delicate recipe and all ovens vary slightly. Check for doneness without opening the oven door around minute 22. Once done, remove from the oven and allow them to cool down completely. Transfer them to a zip bag for storage and refrigerate (see notes). These bread rounds need to be stored in a zip bag or plastic bag to retain their soft, chewy, bread-like texture. Left out overnight will cause them to dry and turn into a meringue-like round, which will crack easily and turn into dust. Thank you for this great recipe, I have a friend who has just been put on a very strict diet plan and no bread is a killer for him as he loves sandwiches, so I made these for him and he loved them, he asked for more, which is amazing because he is also a very fussy eater. So glad he liked them Jerry. Thank you so much for this recipe! However, I am curious: are they supposed to taste a little bit eggy? I’m glad they were successful for you. The recipe is our most basic recipe, easily made into something more savory or sweet by adding seasonings. It is made with eggs and there are no grains… so if you aren’t used to this bread, it can definitely taste different than regular bread. I think this was excellent! I’m on a low carb diet and miss bread…I really miss bread! Even though this isn’t the exact consistency as bread but it reminds me of a croissant. I have tried many substitute “low carb/no carb breads” but all were cheese based and I wasn’t a fan. I used cream cheese and added a teaspoon of salt to the yolk mixture. Salt is needed for your plain cloud bread or it will be very bland (my opinion). I placed in the toaster for some sandwhiches, and it toasted nicely. So far, I made some tuna fish, chicken salad and BLT’s. It turned out great. Another batch I made, prior to baking, I topped with herbs (garlic SALT, rosemary, oregano and basil and some with shredded Colby jack cheese…omitting the regular salt to the yolk as above). Once they were done baking I brushed with melted butter. AMAZING! These will be incredible when making a pot roast and use as a biscuit. My next thing I want to try is make a low carb sausage and gravy and use these as the biscuits. I’m so glad this was a hit Cheri! here is to your low carb success! Stiff peaks that won’t fall out of the bowl when tipped over is a crucial element for this recipe. 1. Use an electric hand mixer – mine is the cheapest and bottom of the range and I get perfect peaks. 2. Use cold egg whites from the fridge. 3. Use a glass or metal bowl as plastic bowls tend retain oils and could be preventing the whites from being whipped up. 4. MOST IMPORTANT of all – there should be no egg shells or or yolk residue in the egg whites or they won’t whip up. An amazing secret – you can use egg shells to scoop out bits of egg yolk that manage to get into the whites. This has worked brilliantly for me since I almost always damage at least one of the yolks. As for the main recipe – I don’t use sugar or sweetener in mine bread. Also these days I have taken to spreading the entire mixture into a large rectangle on a baking sheet. Once cooled I cut these into smaller squares. I make cloud bread in a madelaine cookie pan (abt 18 per recipe). It is easy and they look very special. I use NO sugar or sugar substitute and they taste great. Try them with fresh berries and whipped cream for a “shortcake” treat. I freeze the extras by laying them out flat in freezer bag. You can also put on shredded cheese in the microwave for a few seconds. The madelaine pan makes them far more manageable. Hi Dana, quick question. When you freeze the bread, how long do you thaw and heat it in the oven for? And at what temperature? I tried to make this recipe today and I failed miserably. Im not the most savvy cook but Im really trying haha. Anyway I read some of the comments and saw I should try a hand mixer. I tried this and did it for more than 5 minutes and no peaks rose. The cloud bread as such came out very very flat once baked…but it tasted great. What would be the best way to improve this…Should I mix it by hand with a whisk? Any and all suggestions would be helpful! I really want to make this recipe work! OH! I used fat free cream cheese…could that be what went wrong? I’ve never made it with fat free cream cheese, the light cream cheese does work. The biggest thing with this recipe is to make sure the egg-whites are at stiff peaks. You might try putting the mixing bowl and beaters in the refrigerator an hour before you’ll start baking. I do that with whipped cream and it works every time. Good luck. This should be called Heavenly bread or Angel bread. It is amazing. I’m new to grain free eating and this is perfect. I use an ice cream scoop to drop on parchment. When they come out of the oven I immediately loosen them with a spatula and then leave them on the paper to cool, if I can leave them alone that long. Fresh from the oven with butter is so satisfying. After being in the fridge overnight, I put them in my convection oven for a short time to crisp them up. I’m so glad you enjoyed this recipe and here is to your grain-free journey being a success for you, Nancy! First time I tried making this it was a complete disaster. Then I read the other comments and figured out that I didn’t beat the egg whites enough. Tried again and got much better results. I just need to work on making the size more consistent. The egg whites really need to be beaten to stiff peaks. I’m glad it’s getting better! I have been making these regularly for over a month. For those of whom it hasn’t worked out, please note the recipe is easy provide you stick to the details: egg whites whipped to stiff peaks that will remain in the bowl even if tipped over, folding in yolk mixture gently. My latest addition has been adding 2 teaspoons of psyllium husks. It adds fibre, volume and makes for a firmer texture. If you are going this route then I suggest you add the psyllium husk to the yolk-cheeese mixture but only AFTER you have whipped the whites and you are ready to combine everything. The husk absorbs moisture and will form a dough if it is left standing in the yolk while you whip up the whites. First time I did little rounds. I didn’t peak my egg whites long enough. I did it again and whipped them for 8 minutes and pored the mixture in a smaller baking sheet then cut them into rectangles. I loved this because it was easier. I use parchment paper and take the while sheet out to cool. I love this recipe and can get along much better not having bread. So many options and ways to use it. I am in heaven! Tried this recipe twice and everytime it spreads paperthin and sticks to the baking sheet like glue!! Hi Chrissie, are you spraying the baking sheet? Also, many readers have left comments with troubleshooting suggestions. It might be helpful to take a look at what’s working for others! Being lazy, I found a simple fix. Make them in muffin-top or whoopie pie pans. Spray with cooking spray and they come out well if you let them cool and are careful. If you are too rough they snap in half. If you want them as sandwich buns, make them thin and use two. Muffin-top pans make buns slightly larger than commercial hamburger buns, whoopie pie pans make great slider buns. Good luck! Those are such helpful tips! Thank you, Kaye! I had to share this: I typically make these with 4 eggs and 2 oz of cream cheese. Today, I used 3.5 oz of cream cheese, and beat the eggs stiffer than usual. I topped with rosemary, and crushed sea salt (I was thinking about foccaccia….. They came out tasting like PRETZELS! Delicious. Someone asked abut crisping these: leave them out all day (even overnight), and they become cracker-like. Also: I never bake these longer than 18 minutes; gas oven. They would burn up if I cooked them any longer. and, I always use baking powder. I sent in a lengthy post with recipes, and lots of tips. Seems to be gone. Not sure where it went. Enjoy, everyone! I live on these. Great recipe! Thanks for all of those helpful tips!! Hi can this be made Dairy Free? You can try to use dairy-free cream cheese! I haven’t tried this so I cannot say if it will work or not. Let us know! I don’t know what I did wrong but I tried to make these twice and failed both times. Moving on to some other recipes. Sorry you haven’t had success with them! These can be pretty tricky, but I definitely recommend reading the comments and seeing what has/hasn’t worked for others! How long is the shelf life for these? Refrigerator or no? Refrigerate up to 5 days. You can freeze as well. 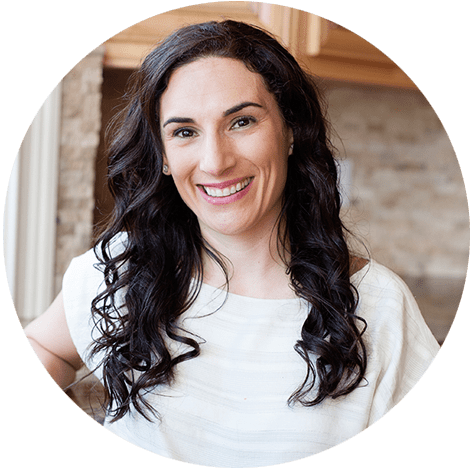 If you have pure essential oils (not from the grocery store), you can add them to the batter to mix up the flavor (i.e., not all oils can be used in cooking – they have to be completely free of any contaminants and 100% pure). I have some variations of essential oils that are good for this recipe: rosemary oil, basil oil, or basil oil with garlic powder, cinnamon oil (with some sugar on top! ), cumin oil. I was thinking even a half drop of cilantro oil – and then use them as taco shells? That sounds awesome! How creative. When to add STEVIA drops? In step 3, when it says to use honey, add the stevia. I’ve made mini pizzas with clouds as crusts but my favorite is making ones about 5 inches across. I take one the next morning and use a turned over juice glass placed on top of the cloud and pressed and twisted until the circle pops out of the middle of the cloud. I heat up a pan with butter, put the hollowed out cloud in the pan and crack an egg into the hole. When nearly cooked through, I flip it, add a sprinkle of cheddar, sprinkle a touch of salt n pepper. Ta da. Bunnies in a basket. Opps I think my comment didn’t go through. I really would like to make this recipe. I went to whip the egg whites, (no yolks made it in) I am using a table mixer. Have made egg white peaks before. I get plenty of bubbles, but it will not form any thing close to peaks. Does anyone know how I can fix this? I would be so grateful. Keep mixing. It takes quite a while to do it by hand. You will get there eventually. Hi Lori, a regular hand mixer should be able to get egg whites to form peaks. I think the cream of tartar is supposed to help (I don’t know the science behind that!). But try a glass or metal mixing bowl, not plastic, apparently that makes a difference. Even the tiniest bit of oil or film on plastic will prevent them from whipping. It should take a few minutes. Use only metal bowl, metal beaters no trace of oily residue. Make sure no soap residue either. Add some cream of tartar to mixture. I find that the table mixer never works well for this, I always use a hand mixer for egg whites. Good luck! Make sure your eggs are room temperature (not cold) or they will never form peaks. How much grams is 1/4 teaspoon? It depends on what you’re measuring, as grams is measuring weight and teaspoons measure volume. If you search “1/4 teaspoon *ingredient* to grams,” something should come up! These are a delicious home-made bread replacement that are practically carb free and very high in protein. They are just like heaven so I call them clouds. Compliments of Kristin Patterson. Not sure what went wrong – nice peaks of white meringue then it got runny after folding in the egg yok-cream cheese mixture. Had all at room temp; did use greek yogurt cream cheese and baking powder. My rounds ran together on the baking sheet and waiting to see final result after baking. Does anyone know the actual nutritional values for this cloud bread? Without the honey, does the carb count drop? Thank you for this recipe! I made it last night, with Greek yogurt instead of cream cheese, and the rounds turned out so cute. They taste about like I expected they would (pretty eggy), but after storing them in the refrigerator overnight in a Ziploc bag, the tops are still quite sticky and mushy. Is that normal? If not, I’m assuming it’s because of the lower quality, thinner Greek yogurt I had on hand. I will have to give it another try with some nice thick yogurt next time! A thicker Greek yogurt would probably solve that. I’m glad that you still liked them! Hi can I use goat cheese instead of cream cheese? I haven’t tested it, but if you try it, let us know how it turns out! Yes! If a recipe is grain-free, it is gluten-free. Thank you. And please ignore my current post, which poses the same question… I guess your response was too prominently located for me to see it …Duh! Not all grain free is gluten free. but from the ingredients in this recipe, it is gluten free. Gluten free people have to be very careful about hidden ingredients. I plan on trying it. Thanks for pointing that out. Hope you love it! I am a Type 1& a half Diabetic (need insulin) and never eat bread, unless it is a wrap or small low-carb tortilla. I’d love to try this, but I am also allergic to eggs! Are there any low-carb bread substitutes out there that aren’t egg based? One or two eggs in a recipe don’t bother me, but egg-based things, like this, do. Thanks! Hi, I’m sorry but these need the eggs for stability. You could omit the sugar in these allergy-friendly pancakes (gluten, dairy, and egg free) and use them as bread. I do that often! You could use the liquid from a can or garbanzo beans for the egg white. Not sure what can replace the yolk though. I have never tried that replacement so I cannot vouche. Have you ever tried flax seed eggs? 1 Tbsp ground flax seed mixed with 3 Tbsp water and soak for 10 minutes = 1 egg. It might be worth experimenting with. Do you know how long they keep in the freezer? I am allergic to egg yolks but not to egg whites. I’m wondering if I could substitute something for the egg yolks — maybe just add extra cream cheese to give it substance? I love the idea. I’ve been living grain and sugar free for quite some time, but sometimes I really long for something like bread. Hi Patricia, I haven’t tested that but if you do, let us know how it turns out! Made two batches today and substituted culinary coconut milk (it is thicker than regular coconut milk) in equal amounts for the cream cheese. I also used a pinch of sea salt instead of cream of tartar (both do equally well in stabilizing beaten eggs whites). What a marvelous grain-free AND dairy-free bread alternative. Plus my 4-year-old loves it! Who could ask for more? The next batch is going to get a sprinkle of cinnamon. Where do you find culinary coconut milk? Is that the same as full-fat canned coconut milk? I was wondering if something could be substituted for the cream cheese to make it dairy free. So Delicious makes culinary coconut milk in a carton! I find it at Whole Foods, but you can order it online. Would you guys happen to know how long the last? I’d say no longer than a week in the fridge. Why is the yolk being removed? I’m not a cook but would like to try these. Using just the whites give it the lightness and “cloud” effect. You should definitely try them! Actually she folds the yolks back in but the eggs need to be separated to whip the whites up into a meringue consistency. This type of bread has been around for years. When Atkins published it the recipe name was “Oopsie Rolls” except it omitted the sugar. It s not a bread texture per se but will hold a sandwich together. The reason for separating the egg is 2 fold. The yolks provide protein and substance. More importantly, you whip the whites into a meringue. It is really important to use room temperature egg whites and get absolutely no yolk in them. My mixture appears to be very runny is this a problem with anybody else? Did you melt the cream cheese too much? I believe it is the whites that provide the protein structure and the yolks are the fat. That is the reason the whites must be beaten separately making certain there is no type of fat on the beaters or in the bowl. Fat will cause the whites to collapse. Then there is both fat and protein in the cream cheese or yogurt, whichever you choose. Fold in the yolk mixture in gently but quickly over the top of the stiff peaks. It is the same technique as for a souffle. By whipping the whites apart from the yolks, you can get much more air into them to create the fluffy clouds. You must not get even a smidgen of yolk in them. Do them one at a time in a separate bowl, only adding the white if it is pure to the other whites. It will not hurt to have some white in with the yolks. egg yolks are added later. whites are whipped to form soft peaks! You need to separate them because the fluffiness comes from making the whites into a simple meringue. If any fat (oil, yolk, etc) touches meringue, it immediately starts to dissolve. So, you fluff up the egg whites all alone with some tartar (which helps hold it together), then you carefully (sooo gently) fold in the already mixed yolk/cheese/sweetner into the egg whites. Have your sheet and oven ready, because once they’re mixed they’ll start to melt. Get them on the pan and in the oven right away. It’s really simple, but remember that once the yolks meet the whites the clock is ticking. I apologize if this has already been asked, but has anyone tried making a double batch by simply doubling the recipe? Is there anything that needs to change with more volume? I made a single batch and loved them. I used them for breakfast sandwiches which I then froze, perfect breakfast. I double the recipe all the time. Enjoy! Do they need to be stored in the refrigerator? Yes, I would recommend storing them in the fridge! I have celiac disease and this is perfect for me. I ate mine with Jelly and butter and it was delicious. My husband is a diabetic so has to watch his carbs and he liked them too. I’m so happy to hear that, Karen! I just made mines now and they taste really good. I didnt have on hand cream of tartar, so, I used baking powder. The touch of honey is just perfect. I noticed they stick to the parchment paper. They are clouds, fluffy because of the egg whites. I definitely will continue doing it. I will put them in a bag and see how the consistency change but so far won 10 chocolates!!! Hahaha. Puertoricans now what Im saying with 10 chocolates! I’m Puerto Rican and totally laughed out loud with the 10 chocolates comment!! My second batch is in the oven now, after eating the first batch in 2 days. I’m at about 6500 feet elevation, and followed the recipe to a T, with the exception of taking it out about 5 or 10 minutes early. It was perfect! Glad you could make it work! I’m wondering what’s going wrong, mixture is great, texture is great, but when they go in pan they spread out so much they end up flatter than a pancake, very flat,, and I spray non stick pan with no carb Pam and they still stick wicked. It’s the flattness that bothers me most, can someone help…. I’m sorry this did not turn out for you as you hoped. They are lightly “fluffy” but not like cake. They are “bread” flats. I saw a video where they said to put the mixture on to a preheated pan. Maybe that would help? I think that her picture at the top is a stack of these breads. My cloud bread seemed to come out very flat and i had added the cream of tartar…. What could I have done wrong? Liz, cloud bread isn’t a full sponge. It’s more like those sandwich rounds that are flat. The cream cheese is essential to this. You could possibly try using a non-dairy cream cheese. I understand how frustrating allergies are! Try culinary coconut cream. It works fablously! There is a lactose free version of cream cheese (company is Lactofree) here in the Uk so possibly elsewhere too? With a little hunting you can find lactose free cream cheese – Green Valley is one brand name. The only thing to do is experiment. Then let us know! I suspect goat soft cheese may work… what about flaxseed flour or meal soaked in water to same volume so it replaces the moisture and physical bulk of cream cheese? You don’t know until you try. You can make cream cheese from lactose free milk! You just need milk, salt and white vinegar and a cheese cloth. Allow milk and salt to boil. Remove from heat. Add the vinegar. Allow it to cool completely. Once cool, pour mixture into a sieve covered in cheese cloth. Let it sit in the fridge overnight. Whisk it before putting it into a container. It will last one month. I’m so happy you love it, Allie! Sorry it didn’t work out for you, Mari! We hope you try it again. salt promotes the coagulation of proteins, which means you have to beat the egg whites longer to unwind the bunched up (coagulated) protein strands and stretch them into the thin films that encase air bubbles and create foam. Second, if added too early, it decreases the stability of the beaten egg whites, which in turn weakens the protein network that forms the structure of the foam. As a results your egg whites would actually wilt and that would cause the yolk to cook faster than it should creating that eggy taste… I hope this helps. What can i replace cream of tartar with? That ingredient is not available in Denmark. Sorry Yvonne but the cream of tartar is not replaceable. You could maybe try to order it! For beating egg whites, cream of tartar can sometimes be replaced with 1/8 tsp white vinegar per egg white. It’s worth a try! Try baking powder. Cream of tartar has a property that helps the egg whites hold their shape so to speak, but baking powder is more of a flufer, so might have similar results. I copied this from an article on the net…. hope it helps. If you don’t have it in your pantry and your recipe calls for it, just substitute fresh lemon juice or white vinegar for the cream of tartar. For every 1/2 teaspoon of baking soda in the recipe, use 1 teaspoon lemon juice or white vinegar. As an example, if your cookie recipe calls for 1 teaspoon baking soda, add 2 teaspoons lemon juice instead of the cream of tartar. If your simple syrup recipe asks for 1/8 teaspoon cream of tartar, use 3-4 drops of lemon juice. And for the whipping egg whites? Add 1/2 teaspoon lemon juice per egg white. A quick Google search says that cream of tartar is called Visten-pulver in Danish and is available in apotek (pharmacy) or health food shops. I hope this info is factual and helpful. . I used a recipe off of Facebook that said 1/4 teaspoon of baking powder or cream of tartar. I used baking powder and they came out fine. A lot of cloud bread recipes call for baking powder instead. just substitute fresh lemon juice or white vinegar for the cream of tartar. I’ve been a T1 diabetic over 30 years and yeast free for 5 years. A no carb, yeast free bread substitution with ingredients I’d have on hand anyway is a dream come true for me! Almond butter worked great in place of the cream cheese. Garlic powder and a bit of garted parmesan cheese in them is delicious for a savory snack or tomato sandwich. Cinnamon… definitely! Thank you for this recipe! Can I add cheese to the recipe and then bake? I haven’t tried that so I can’t give solid advice, but it might work. Let us know! I wonder if the people who complain that these cook too fast or burn are living in the UK and are not converting Fahrenheit to Centigrade? All the recipes in our website are in Fahrenheit but consider it done. You don’t “peak” interest. You “pique” interest. The bread looks good, thanks. Can you use light or fat free cream cheese? Thanks!! Yes, you can definitely try that. Let us know how it works out! You don’t have to use sweetener! The recipe says to store in a plastic bag or container. Do they have to be refrigerated or can they be kept at room temperature? I would highly suggest refrigerated them, at least after the first day. Love your recipe! just wondering if you have tried a cloud bread grilled cheese? Hi Katy! It only works with day-old cloud bread, otherwise the bread will melt. Thanks! I followed your recipe to the letter. The hardest part is to be patient while beating the egg whites and getting them glossy and really firm. They are perfect. In the morning I heat one or two up in a toaster oven, a little sweet butter or jelly or just plain and yum! It satisfies your longing for a bagel or English muffing without the gluten issues. Thanks for the recipe and thanks to my friend Cindy for giving me the information about Cloud Bread. YUM!!! I’m on weight watchers and was so intrigued by this recipe, but after adding everything up, and using Stevia instead of Honey, this ends up being 1 Smart Point per piece (if you make 10 pcs as this recipe directs). Which is great, but you can buy commercially prepared bread that has the same exact “value”. I def appreciate the recipe, and the fact that if you make it, you know exactly what goes in it, but I will not be making this. Not all calories are used by the body the same even if they are worth the same “points.” Being gluten free due to Celiac’s and grainfree and low carb by choice I can not wait to try these! Hope you love it, Nikki! The main benefit of the recipe is that it is a very low carb bread-like yet grain free substitution. The calories and point issue is secondary although good to know if you are on this plan. Thanks for counting it all up! Cloud bread isn’t “diet” bread…..it’s a way of getting a “bread like” product without grains and glutens. For those of us Paleo or just intolerant, it’s beautiful thing! not everyone is on weight watchers and some of us specifically need low carb. I find it quite rude to the blogger that you comment somewhat negatively without even trying the recipe. the world doesn’t need to know your every thought. and yes, I take it as my personal mission to let folks know, because people seem to have lost all semblance of manners. I personally really liked this recipe. You took the words right out of my mouth! Why people find it necessary to present every thought and (de)constructive criticism is beyond me. I made this recipe on Periscope today (and credited this blog) and it’s pretty darned fantastic. It destroyed all of my skepticism about the eggs and texture. I’m so glad this was a success for you Michelle! and live on periscope! my hero!!! I’m a low carb girl.. I have been looking for a bread alternative that’s not loaded with the same garbage as regular bread. This is Perfect. Tried it loved it Sorry some seem to be negative ninnies but there is way more going on out there than Weight watchers. I like my food to be real and to contain things I can pronounce.Thank you for the recipe! Stef, you may want to look for a one minute low carb muffin—it uses egg and flax seed for a very uffin like texture. You can add savory or sweet to it for your purposes (I do sweet with cinnamon and APlenda for breakfast and celery seed and onion powder for a savory muffin). Not sure if Momables has this recipe but most low card sites have a version. Amen! On all counts! I can’t tolerate grains… This bread is THE BOMB!!! Some people aren’t counting points, but have health concerns that lead to dietary restrictions where this recipe is a saving grace! (Gluten free, carb free, sugar free, etc.) I suggest not being a debbie downer just because you don’t have these issues, as so many other appreciate and embrace this with enthusiasm. If you can’t say something nice, is it necessary to say anything at all? Would these work as a tortilla, do you think? I’ve never tried it that thin. I am using these for a gluten free kid and have no honey on hand…would a bit of maple syrup work instead? Is it just for sweetness? Thanks…I can’t wait to try these! Maple syrup should work. Hope your kid loves it! Can you use these to make grilled cheese? Thanks for the question! They might not hold up in a skillet with all the cheese, but you could definitely try and let us know how it turns out. Because I find it easier to measure cream cheese by weight, my husband kindly searched for the equivalent. In this case, 1 oz. equals 2 tablespoons, so 2 ounces would equal 4 tablespoons. Mine seem flat…. the egg whites were beaten and I could hold the spoon upside down… do they rise when they cool? Or should i have beaten them longer? Chelsea, they aren’t fluffy, they are more like the sandwich rounds found at the store but grain free. They are more flat than fluffy with a spongy-like texture. Can these also be baked in a microwave? no. a microwave is only for heating up foods not baking. sorry! At the end of the recipe you say they can be nice and crisp how do you make them that way? the edges will be crispy while the bread is nice and soft. I just made these and they are great! I made a second batch (in the oven now) and folded in 1/2 cup shredded cheddar at the very end. The next batch will be with cinnamon, as a breakfast bread. Thank you so much for this recipe! Must try this, the cheese and cinnamon options sound yummy! I made these successfully (twice now) with almond butter in place of the cream cheese. They come out awesome. Thanks for a GREAT recipe! I tried making these and they didn’t tuen out. The two mixtures never really combined well and when I put them in the oven they burnt super fast and ruined both my trays. Do you think it’s because I didn’t whip the eggs enough? Did you make any other adjustments or substitutions? The egg whites need to be beaten to stiff peaks. Like if you hold the egg whites in a spoon upside down they don’t come off. They should not have burned fast at 300F. Sorry! Is there any way of making these with a dairy free cream cheese substitute? I can’t have dairy or wheat and have been looking for a good “sandwich bread” alternative. If not I’ll have to do some experimenting! I have not tried this with almond butter. sorry! I’ve made these a few times and I love them. Great substitute for bread. I have one problem…after I’ve refrigerated them, the tops are very sticky (for lack of a better term). If I hold them in my hand, to butter the other side, a thin layer of “bread” comes off. Am I just not cooking them long enough? Ideas? they are very delicate. I have a couple of sheets of parchment paper that I reuse to store these in the fridge and use it to line in between each round. Hi Laura, new to the site and it’s impressive. Thanks for the invite. Questions about your “Cloud Bread” grain free bread substitute, Would it be possible to invert the pan and let them cool as would an angel food cake to keep more volume? I guess they’d have to be allowed to adhere to the pan. I’ll try it with unsprayed/lightly sprayed . Should the oven be hotter then for a good rise? Would a couple tablespoons of flour and a quarter tsp of baking powder and/or quick yeast make it more substantial but still somewhat low carb? Thanks in advance for your time, and keep up the great work. William, these are best baked longer at a lower temperature in the oven. at a higher temperature they burned. This recipe is meant as a grain free alternative to sandwich rounds. It works well as written. They are not mean to be “cake” but as “sandwich” holders. I hope this helps. Made some of these last night, and used them for a quick sandwich at lunchtime today. They’re like sandwich rounds, without a bread-y taste! Brilliant recipe!! I have made it so many times now I can do it without the recipe. Hubby and I are on a low carb / low calorie diet. I wanted to see if I could get the calorie count a little lower. I substituted the cream cheese with non-fat greek yogurt and it works fine. I also use 4 egg whites and only 2 yolks and liquid stevia instead of honey. I don’t think it changes the integrity of the bread. I have posted the calorie breakdown below. Also, someone mentioned that theirs cooked very thin and very quickly. I have 2 ovens and was going to do a double batch. The lower oven must have cooked hotter because they were done in 20 minutes or less. When they came out, they still tasted good but they flattened significantly as they cooled. You might want to try cooking them at 250 or less. They really should take their time cooking. This recipe is exactly what I’m looking for! I was just wondering if greek yogurt (with as much whey removed as possible in order to be solid) or ricotta cheese would be suitable substitutes for cream cheese. The consistencies don’t seem to be too different, but I just want to double-check! Sofia, I’ve tried it once with full fat greek yogurt. They didn’t hold as well. the thing about cream cheese is that while the texture is similar it melts when heated and it reconstitutes its shape/texture when it cools. yogurt and ricotta cheese don’t and thus they aren’t the same. I’m so excited to try this recipe!! I’d love to try this as I’m type 2 and my A1C has gone up BUT I can’t have eggs due to an allergy. I usually use chia or flax seed for egg. Could you tell me how I can make these egg free? As mentioned above, I have not tried these with an egg substitute. I think I made them wrong; mine taste reaaallly eggy. I did use cottage cheese, maybe I’ll try cream cheese. What do you think I did wrong?! I know it’s hard to tell by me just saying “they taste eggy” Haha. Barb, cottage cheese will break down and not hold in this recipe. We specifically use cream cheese for this very reason. sorry! Freida, the recipe specifically asks that you start with softened cream cheese not cut up. Unsoftened cream cheese won’t yield the breads. sorry! Thank you so much for this recipe!! I made cheesey garlic bread and it was amazing! I think I will be making these frequently!!! Do you know how long a batch will keep? Do they need to be refrigerated? I’m just wondering if I made a batch on the weekends, if they will stay good through the school week. Thanks for all the great diabetic friendly recipes!!! about 3 days in the fridge is how long I would keep it. For a dairy free option there is a product that is tofu cream cheese. In australia marketed as Tofutti. I believe it would work the same as cream cheese because I cant tell the difference. I have not tried it with Tofutti. If you do, please let us know how it comes out! Does anyone know the nutrition breakdown on these? You are welcome to plug the ingredients in a recipe nutrition calculator website. Is there any way I can skip the cream of tartar? I really want to try these and I don’t have any! An equivalent to cream of tartar is vinegar. You can substitute baking powder for the cream of tartar. Works great! Do you find cottage cheese works better than cream cheese? No. Cream cheese works better. It has a consistent texture. I’ve made these a couple times with cottage cheese without problems. I haven’t tried it with cream cheese, so maybe I’m spoiled by not knowing the ideal, but they seem pretty good to me. The first time I just tried to mash the cottage cheese lumps, but they didn’t go away completely and left some harder bits in the finished product. Not the best, but I could deal with it. I think I also used maybe low fat cottage cheese? I don’t know, I had it on hand which is why I wanted to use it. The next time I put the cottage cheese in my blender with the egg yolks to make it super smooth and then folded it into the egg whites. Lumps are gone and I still have my clouds! This time I used a more full fat cottage cheese. I then cooked them on parchment paper and had no problems at all with sticking or excessive “spread”. I also added in garlic powder and pepper instead of the stevia both times, but I don’t think that should have changed the texture much. Thanks so much for all your helpful tips! I have frozen them before but the texture of the re-toast isn’t the best. After I freeze them I use them for grain free pizza dough rounds. I have. the consistency isn’t the same when you toast them but I use them as grain free pizza bases. Firstly, I LOVE this recipe! I don’t even use any sweetener at all and they make awesome breakfast sandwiches! I would also like a dairy free version. I am not sure Bex…. you could give it a try. Wondering if anyone has ever tried these dairy free? No. This recipe was not developed as dairy free. The cream cheese alternative I used broke down. Can I use a pack of Splenda instead of stevia? Hi. Could I use xylitol? And if so how much would I use? I’m sorry, I don’t use xylitol so I don’t know. Would you know what the calories are on these? My husband is counting calories and I’m a type 2 diabetic, so I know I can eat these, just would like to know about calories. Thanks! I dont, but you are welcome to plug the ingredients into many of the websites that offer nutrition facts for free. Making these for the first time… Hope they turn out, it seemed a bit runny. Was wondering if you could make them in a pie pan and cut them up when cooled.? Angel, I’ve never made them in a pie pan. If you try them, let me know how they come out. Well… I’m not sure what I did wrong. They were not fluffy like the pic. They only took half the time to cook and one totally disintegrated! I’m sure it has something to do with the “folding of the egg whites”. I thought they were quite thin but had to scrape to get the 10th one. That said… THESE WERE AMAZING!!!!! I ate 2 right away and am eating another 2 this morning! I was wondering if you had experimented with this… tried making pancakes, rolls, or some sort of “loaf” or “biscuit”. I will most definitely try these again! “Perfect” or not they are delicious! And satisfy that “need” for bread that I had almost given up on. OY. I’m not sure “what went wrong” but I’m glad you were able to salvage the recipe and make it work! We are working on a grain free meal plan so make sure you re subscribed to our weekly newsletter for more details and grain free recipes. i just made these and they were pretty brown but not crispy when i took them out. did i make them too thick? i’m afraid if i left in longer they would burn? does it mean they are undercooked if they didn’t get crispy? thanks! I love this recipe. I’m also allergic to milk products. What can I substitute for the cottege cheese? Bette, unfortunately, this is not a dairy free recipe. Dairy free cream cheese might work, I think the brand is dalia(spelling?) it just came out. Ashley, I just tried it with dairy free cream cheese, they didn’t have the same texture. I can’t wait to try this! Do you think I could add some ground flax? Just wondering if I could up the fiber in any way? Even without I give it a try! Maybe, but no more than 2 teaspoons for the entire recipe. I am not sure. Please check out the conversions for your brand. It’s optional and I don’t include it when I make mine.